Despite initial reservations, it’s turned out that I really rather like Twitter. I set up an account last April and, although making connections has been slow, it’s been great for finding like-minded people… especially folks recycling, reusing, repairing and repurposing. In addition, on days when I don’t want to embark on reading long posts, it keeps me connected with the world. Anyway, through a regular weekly discussion via Twitter – Make do and mend Hour – I also encountered a large family of critters, The ‘Vaarks. Originally created by Danielle Lowy of The Make it Shop in Manchester, and featured in her booklet How to Make Monsters & Monkeys, the ‘vaarks have taken on a life of their own. Various ‘vaarks have their own Twitter feeds – @Ratvaark, @Mousevaark, @Bendivaark and @Phileas_Vaark – sharing their adventures in gardening, repairing, reusing objects and eating cake. And, so I hankered after my own ‘vaark. The originals are each stitched from an old sock, but being me, I didn’t fancy sewing and kept looking at the spare knitted snail shell and some left-over sock yarn I had to hand. Then I mentioned on Twitter my desire to make a snail version of a ‘vaark, and thus the seed was sown. I just had to make a snailvaark. Not only did I have to make a snailvaark, however, I had to make one (at the request of Alfred, one of Ratvaark’s guardians) that was able to retreat into his shell. I thought about it long and hard and didn’t make any progress, and then I heard that Ratvaark and his folks are coming to west Wales in May, and want to meet up for cake… hopefully with snailvaark too. In May, there will be a grand ‘vaark gathering (the crowd above plus Bendivaark who lives locally), with tea and cake… who says we can’t develop meaningful relationships via the internet? For many years now we have bought much of our meat by mail order from a company specialising in organic produce. Up until out latest order they always sent a pre-paid address label so that we could return and they could re-use the insulated packaging. Our last parcel, however did not contain the label. I enquired, only to discover that the cost of postage has made return of the polystyrene boxes uneconomic. I’m so cross about this… repeated reuse of packaging is such a great idea. Our local council do accept polystyrene for recycling, but I really didn’t want to take advantage of this unless absolutely necessary*. We thought about paying for the boxes to be returned or even dropping them off when we are over in that direction, but I’m not sure whether the company would accept them back (I will check next time). So, they have been sitting in our hallway whilst I waited for inspiration to strike – which it did on Saturday whilst I was planting seeds. I had two boxes, so I stabbed a few holes in the bottom of one, chucked in some compost, sowed some winter lettuce seeds and covered it with its lid. And there was a nice insulated growing space for some winter leaves. I’m keeping it in the limery and hopefully I will have a crop from it in a few weeks time. Having decided to focus on growing, I am keeping the other box for cultivating mushrooms. I ordered some mushroom spawn (the fungal equivalent of seeds) last week and when it arrives, I’ll use the the second polystyrene box as a mushroom propagator. Of course, I can’t find a use for a never-ending supply of polystyrene boxes, but at least the current ones are turning out to be useful. I will find out whether the meat company would be prepared to take any other ones we receive back and will return them at our cost if possible, but for now I’m satisfied to have found good uses for something it would have been all too easy to consign to the recycling. * It’s generally more energy-efficient (and therefore, greener) to re-use or re-purpose than to recycle. I really am hopeless at throwing things out… so many items might just possibly come in useful in the future and I just can’t bring myself to consider them to be trash. Even recycling can be a challenge, because I’m always aware that it’s better to reuse or repurpose an object than to break it down and make it into a whole new something. As a result of this, our contributions to landfill are small, but our house is stuffed full of, well, stuff. We are trying very hard to cut down on what comes into the house to avoid too much accumulation. Recently I have been trying to have a bit of a clear-out, before my office bursts at the seams and so a few weeks ago I went through some old calendars and diaries, cut out any pictures I thought might be useful for teaching (the Trees for Life diaries were particularly good for this) and put the remnants in the recycling. There was one calendar, however, that I just couldn’t bring myself to dispose of because it was made by my friend Anja for 2003 and contained lots of her own drawings. So, I put it to one side thinking that, perhaps I would cut it up and make a collage of the pictures. Then yesterday, Mr Snail-of-happiness came across it and noticed that the days were right for this year… it’s 11 years old and that’s the time that the days and dates match up again. 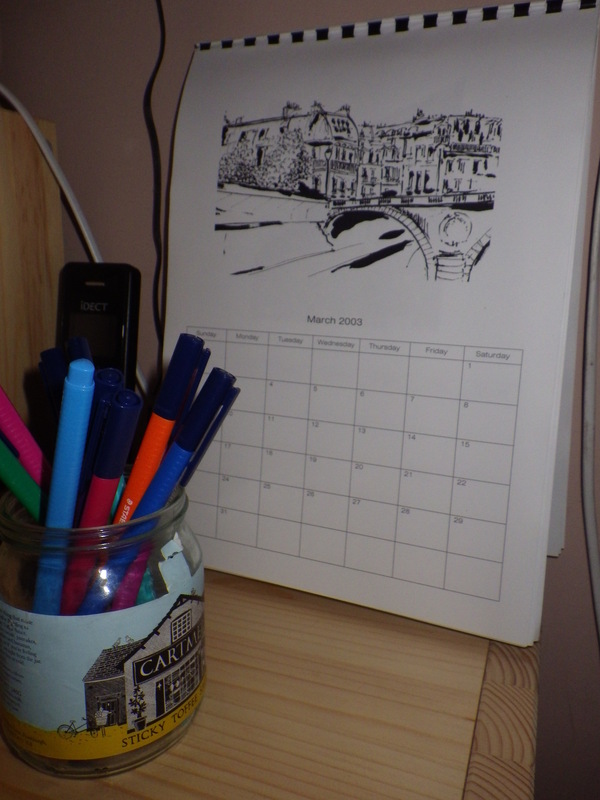 So, Anja’s calendar is now in use again (I hadn’t written on it first time round because it was so lovely) in my office and I am feeling smug that I didn’t throw it out or cut it up. OK, OK, I know that I can’t keep everything, but sometimes I do feel pleased with myself that I held on to an item that did turn out to be useful.